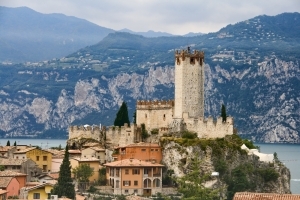 The small but very picturesque and lovely town of Sirmione is located on a long and narrow peninsula surrounded by the azure waters of Lake Garda. The outstanding beauty of this place, extolled by the Roman poet Catullus, still attracts huge numbers of tourists to Sirmione. Tourists roam slowly along the small narrow streets and blooming avenues straight to the town’s main attraction, namely the old Scaliger Castle. This majestic and inaccessible castle, surrounded by water on all sides, was built by a powerful ruler from the Scaliger dynasty to protect access to Verona. 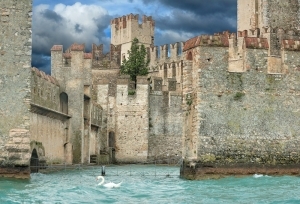 Scaliger Castle did not see any fierce battles so its serrated walls and massive square towers remained practically unchanged, except that the Castle is now guarded by wild ducks and swans, not by patrols of watchmen. Scaliger Castle housed military garrisons and warehouses for several centuries, so it would be unwise to expect that the interior preserves its original medieval appearance. Tourists do not visit Scaliger Castle to see its interior. 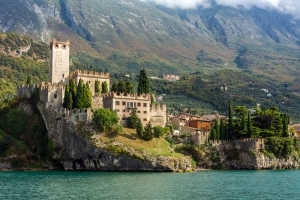 They visit the Castle to touch the serrated walls, to walk in their shadow around the courtyard, or to climb up a high tower and take in the endless blue of Lake Garda, the panorama of the old town’s roofs and to enjoy the quiet and peaceful atmosphere of these idyllic landscapes. Tourists get into the inner courtyard through the main entrance which is dominated by a 47-metre tower. There is a viewing platform on the top of the tower. Some elements on the courtyard are stone imitations decorated with the sgraffito technique. The merlons on the fortified walls give them the shape of a "swallow's tail", which at that time not only served as a decoration but also associated the Castle’s rulers with the Gibellini family, supporter of the German emperor. 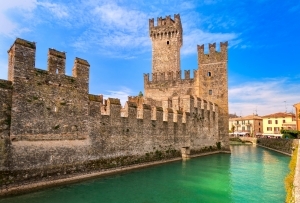 You can enjoy the panorama of Sirmione on the viewing platform and look down at the adjacent harbour, which is really rare among European castles. The merlons on the walls that protect the port are square because they were rebuilt during the time of the Venetian Republic. The castle complex includes St. Anna Della Rocca’s Church built in the 12th c. and later often used by soldiers from the castle garrison. Frescos dated from the 14th-17th c. survived inside the Church. Sunday – from 9:30 to 12:00 and from 14:00 to 17:30.